Denon DJ’s Prime 4 is a groundbreaking all-in-one standalone DJ system that lets you spin with up to four decks. It is a remarkably mature, hugely powerful, immensely exciting, and great value-for-money DJ system. It has a beautiful, smooth and responsive touchscreen, plenty of controls that digital DJs have grown to love, and the ability to access various storage media including USB and a massive 1TB SATA hard drive. It’s light years ahead of any other standalone DJ system out there, and its feature set even smashes pro club systems that are triple its price point. Your move, Pioneer DJ. On paper, the Denon DJ Prime 4 is the most powerful standalone DJ system ever made – no laptop required! DJing from USB, SD or SATA hard drive, you get four full channels of digital audio, a big touchscreen that’s smooth and responsive, and pretty much all the performance features you find on the best DJ software. Hardware, it seems, is finally catching up with the “software plus controller” method of DJing that has been the most fun way to do this for a decade now. And it’s Denon DJ, not the current stalwart of the DJ booth Pioneer DJ, currently leading the way. So do DJs need to take their laptops into the DJ booth at all now? Have we come full circle, back to the days where DJs simply turn up with their music and a pair of headphones and play on the gear that’s there – but this time, with all the features of software finally available to them? Does the Prime 4 mark the beginning of the end for laptop DJing? Well let’s hold that thought right there, get stuck into our full review (now we’ve had a week or so to play with a unit), and I’ll return to answer these questions at the end. Hopefully by then you’ll have a much better idea as to whether this US$1699 unit is the right next step for you in your own DJing. This thing is absolutely gorgeous out of the box. It is not as wide as you might think, but a bit deeper than expected. It is finished in metal, and feels solid and professional. As well as the unit, there is a power cable (no separate transformer, which is nice; the transformer is built in to the unit), a special USB cable (more on this below), and a quick start guide. The screen is the first thing we noticed. It’s glass-topped, and certainly doesn’t feel like a weak spot, even when it’s propped up to one of the available angles using the clip-out wire stand; however, it does stick out of the back of the unit when folded flat, and would be vulnerable to knocks in transit. The screen does, however, come with a neat, high-quality fitted cover/case to protect it. Nonetheless, a decent flight case or fitted bag would be advisable, not only because of the screen, but because the unit is just a little bit too big to pop under your arm and walk with comfortably. The top panel of the unit is metal, with various finishes differentiating the mixer, decks and the panels of controls above the decks. Setting up involves going to Denon DJ’s website, making an account if you don’t already have one, and downloading the software to be able to prepare your music. Once you’ve prepared a set in the software (see below) and exported some music to a USB or SD card, you turn the unit on, and plug your SD card or USB drive into the unit. Add your powered speakers and a pair of headphones, and you’re good to go. Note that the unit will also accept up to a 1TB SATA hard drive, which you can fit into a port on its underside. That means you could easily keep your entire music collection on the Prime 4. So if you wanted to do this, you’d add a drive of your choice, and manage that drive from your laptop, using a special type of USB cable that is provided in the box. Hang on, isn’t this meant to be a “no laptop required” DJ unit, you may ask? Well yes, but to get files to play on it, you’re going to need to use a computer for downloading, and so it also makes sense to use that same computer to do some track preparation too – and that’s where Engine Prime comes in. It’s a library management app, and if you’ve used Rekordbox in this mode with Pioneer gear, you’ll know the score: You can import your tracks, sort them into crates and playlists, add artwork, alter info like artist and title, analyse for musical key, add cue points and loops, even practise mixes in a rudimentary way. When you’re done, you can export the tracks plus all that info to your removable media, ready to plug in to the Prime 4 unit. This is not a review of the software, but in short: It’s OK, but not as good as Rekordbox – it misses dynamic playlists that populate according to your choice of rules (“all my house tunes from 1988 to 1992”, for instance) and there are none of Rekordbox’s powerful tagging features, either. 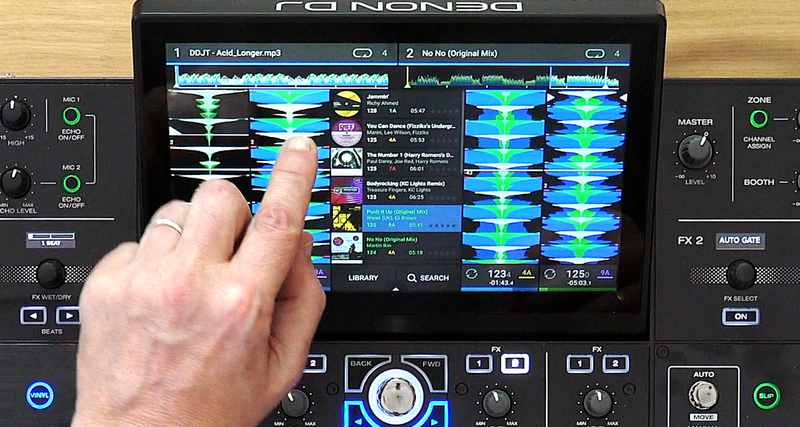 Denon DJ is investing heavily in software development so hopefully some of these features are coming. One thing the company has included, though, is compatibility with other DJ software: You can export your Rekordbox and Traktor libraries and point Engine Prime at them and it will import much of the info they carry, and integration is even tighter with Serato, with your Serato crates plus all other info such as cues visible read-only as an option right there in the file tree. This is unheard of in DJ software, and a great boost for people coming to this system from the other systems. Exporting tracks to SD dragged on our system. If you have a big library, you may want to leave some time while you wait for that to happen. It took 10 minutes to do 150 tracks in our test. We didn’t have time to run tests with other USB drives and cards, so this isn’t definitive. The mixer is four-channel and has full standalone capability, meaning you can plug in four external sources and switch them in place of the digital channels. 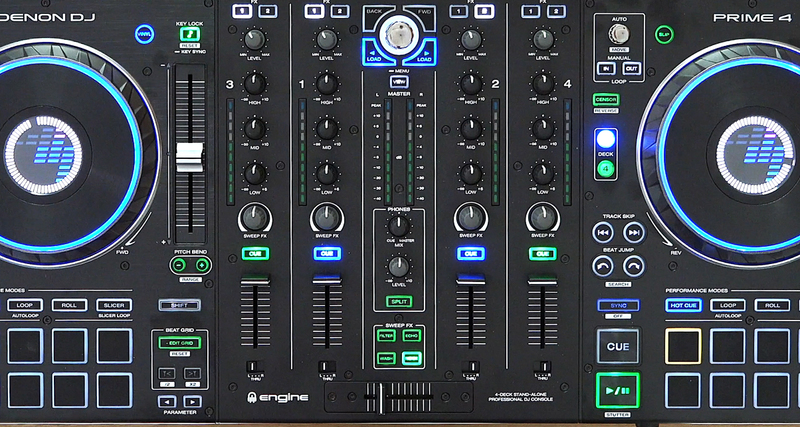 Each channel has three-band EQ and gain (“level”) plus individual nine-bar VU monitoring, in Denon DJ’s colour scheme of green, white and blue (blue being “too loud”), plus a nine-band master dual VU. The channels can be switched to work with the crossfader on either side, and each also has a Cue button, that lights up to match the colour chosen for each digital deck – something that also shows in various other places including the LED ring around the jogwheels. The headphones get a cue/master and a volume control too, and – rejoice – the split cue button has made it across from the X1800 mixer, making DJing without a monitor speaker a cinch. At the top of the mixer section are buttons to switch in either of the two main effects engines per channel – and speaking of effects, each channel gets not only the expected one-knob Filter, but also Echo, Wash and Noise effects, collectively called the “Sweep FX”. By the way, all the effects work on external inputs as well as the digital channels. Finally, there is a library scroll knob top centre of the mixer with colour-coded load buttons for each deck, and back/forward buttons for navigating the screen. 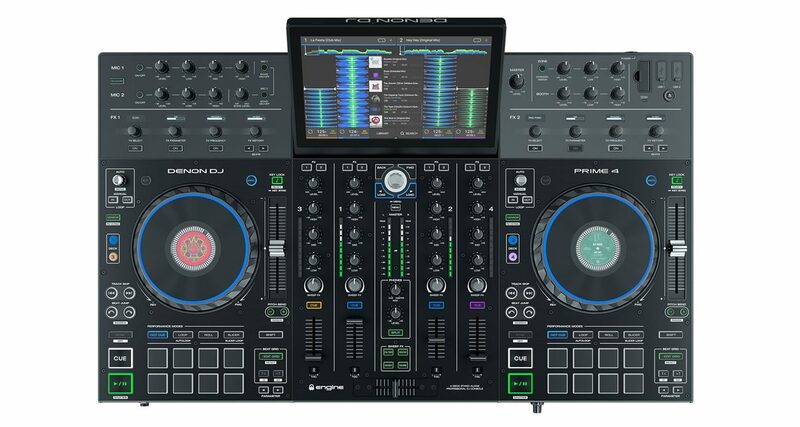 The decks are identical to each other, save that on the left deck you get buttons to switch between digital decks 1 and 3, and on the right deck, between digital decks 2 and 4. At the centre of each deck is the jogwheel, which itself has a screen at the centre that displays track artwork or your choice of logo (you just drop a PNG into the root of the drive you’re DJing from). The jog screens also display loop length as needed, as a clear large white number. There is also the aforementioned LED ring, in a colour that identifies the deck (by default blue for decks 1 and 2, and green for decks 3 and 4). The jogs measure 5″ across at the top and 6″ across at the bottom. They’re high-quality and just the right weight, although we feel that on a controller this big, they could have been an inch bigger. Immediately above them are the Slip and Vinyl buttons, the latter determining whether the top surface of the jogs nudge like the jog edges, or exhibits “scratch” behaviour. The pitch controls are long throw, smooth, and accurate, with key lock and key sync on a button above (yes, this unit has key sync, unlike the SC5000 pro units as it happens), and Denon DJ’s much-loved Pitch Bend buttons below. Holding Shift and pressing the pitch buttons alters the pitch range. Top-left of the jogs are standard loop controls – a rotary encoder to half/double loop length with push for on/off, plus manual loop in/out buttons. This particular knob is in the same shiny metal look of the library scroll knob – we like these controls, but some people feel they look cheap. Beneath these is a censor/reverse button (the latter activated with Shift). 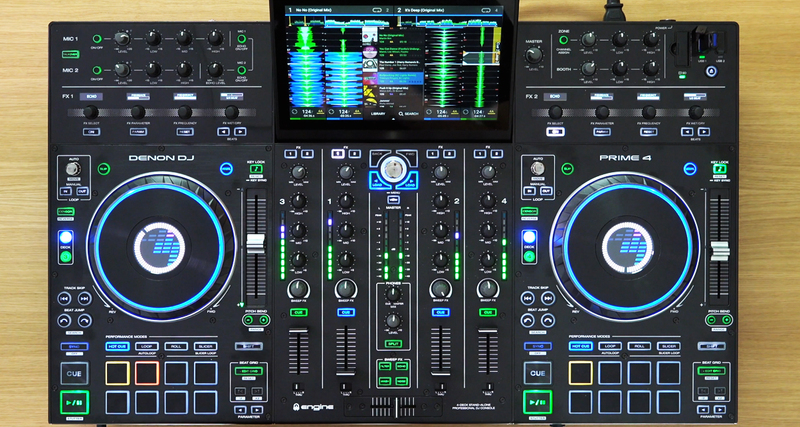 Bottom left of the decks are track skip buttons to navigate quickly through a playlist or jump to the start of the current song; Beat Jump buttons that jump forward or back respecting the position in the current phrase (the length of which is set on the loop encoder) and that also let you search or “scrub” through a track when Shift is held; and also hard plastic cue and play/pause buttons, that are super responsive. The sync button is down here, too. Finally, bottom right of the jogs are the beatgrid controls, that let you edit beatgrids on the fly, although you can only shift the grid and double or half the BPM; there is no way of correcting an incorrect BPM apart from that, and no “tap” button for manually adding a BPM. A notable omission is any type of sampler on the pads or indeed anywhere on the unit. Also, the parameter buttons to the bottom left of the pads can be used with the pads, for instance to alter the range of the loop lengths on Loop mode, but it’s not always clear what you’ve altered as sometimes there’s nowhere on any of the displays that shows you what you’ve done with these buttons. Top-left are two mic channels – mics are one of Denon DJ’s strong points, reflecting the brand’s mobile/event DJ pedigree. Here you get two fully featured channels, independent of the four music channels, with on/off, level, two and three-band EQ, and an Echo effect, that you can switch on and off per channel. One unique feature of the Prime 4 is its independent zone output. This is again aimed squarely at mobile DJs, and lets the DJ programme completely different music somewhere other than the “main room”. It’s situated at the extreme top right of the Prime 4, next to the master volume control, and above the booth control (booth has volume and two-band EQ, by the way). The zone section has an on/off button and a level plus two-band EQ. The idea is that you start a track playing on Deck 4 from a playlist, hit the on button, and Deck 4 will now play the tracks from that playlist in sequence via the zone output, which can be wired to the second room. Meanwhile, the other three channels of the mixer remain available to you to DJ the main room from. You can also switch channel 4 to external and play a smartphone or similar through the fourth channel to the zone if you wish. The effects engines – two of them – are above the decks, and comprise 14 effects that can be cycled through via the leftmost of the four rotary encoders, each of which has a button or buttons underneath it for further control. The rightmost knob is wet/dry, and the other two control various parameters, a neat staple being the Frequency knob, that decides how much of the inputted source or sources’ frequency range takes the chosen effect. A great part about the effects are the tiny monochrome screens above each knob, telling you the effect chosen (lefthand knob), the amount of the parameter selected, in the form of a bar (the rest), plus additionally the LFO length expressed in beats (the far-right one). Note: In the accompanying video we go through the effects at length, demoing how they sound. Your SD cards (one slot) or USB drives (two slots) are plugged into the unit top-right, and in the case of the USBs, that means they stick out (ie they are not recessed at the front, like on the standalone SC5000 players). Speaking of the front of the unit, that’s where you’ll find the line/digital switches for the mixer, as well as fader start on/off switches and the crossfader contour knob. Round the back of the unit are two additional USB sockets (one of which can also charge devices plugged into it); another USB for use when managing any installed SATA drive; the Link Ethernet-style socket for controlling visuals via Resolume or SoundSwitch; and the gamut of inputs/outputs: master out, zone out and booth out balanced XLRs; master out unbalanced RCAs; and four RCA inputs for line (two switchable to phono). There are two omni mic sockets too, taking 1/4″ jack inputs as well as XLRs. A nice touch is a stereo/mono switch for the master outs: Not all sound systems are in stereo, and often even with ones that are, you’d prefer your output to be in mono. It’s a good-to-have option. Unlike the previous MCX8000 unit, the Prime 4 of course has a big central screen (that unit had two smaller ones). It’s a big improvement. The screen has two main modes: Library and waveforms. Even in waveform view, the current playlist remains in the middle of the screen. The waveforms scroll vertically. Underneath each waveform are readouts showing current BPM, sync status, and time elapsed/left (tap to toggle) for each deck, and the active decks have their full waveforms displayed horizontally across the top. In Library mode the screen is given over to your music lists. Down the left-hand side are collection/crates, playlists, preparation window, and search icons. Tapping “search” brings up a Qwerty keyboard for live filtered search, and you can select search parameters including which metadata fields to include or leave out. There are pre-determined filters such as BPM and key, which can be refined further (for instance, you can filter for the same or compatible keys, and choose your tolerance for BPM results, eg -/+ 2BPM, -/+ 4BPM etc.). Swiping tunes either adds them to the prepare list (they disappear from that list when you play them, a bit like pulling a tune half-way out in a record crate of old), or loads them immediately (you get a choice of the four decks onscreen to tap), depending on the direction of swipe. A small “edit” button lets you highlight tracks, single or multiple, and add them to playlists and crates by dragging and dropping them. A final but important use for the screens is to control the two settings/options-type menus, to choose between input sources, and to record your sets: A long hold on the hardware “view” button (also used to toggle between library and waveform views) brings up the options here. Recording is easy, and happens to your choice of plugged-in media; and for settings, think just about everything under the sun: Mic attenuation EQ crossovers, and kill preferences, filter resonance and type, screen brightness, even your choice of colours for the jogwheels (I pimped our review unit into Digital DJ Tips colours , which you can see in the video). You can also update the firmware and various other housekeeping functions here. Note that some of these settings can come across from your Engine Prime software via USB/SD, and be returned to it, as per how you set it up. So having looked in detail at what’s on the unit… what is it like to DJ with? 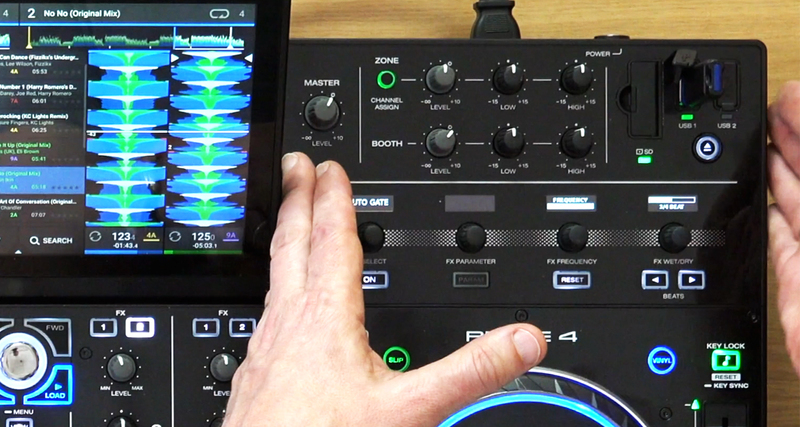 In short – it feels like DJing with a laptop and DJ software, and a really good controller. That is praise indeed for a standalone unit. DJing is like driving a car – you want the unit to get out of your way and let you do your thing. 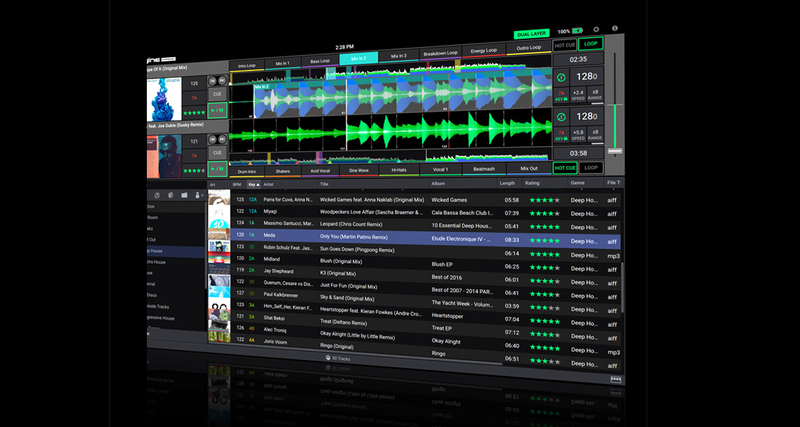 It does – and it does so with most of the bells and whistles of software DJing there, present and fully available. It is smooth and responsive; even when you introduce music to it just as a bunch of files, it very quickly analyses those files to show waveforms, work out musical key and BPM, add beatgrids, and so on. This makes DJing feel intuitive and fun. 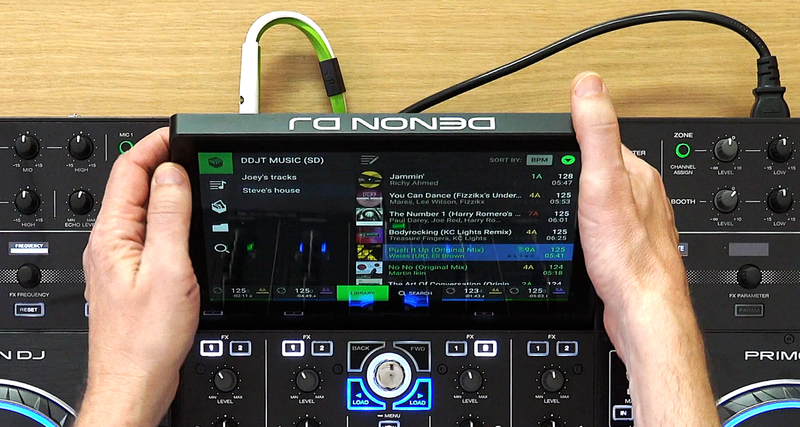 Denon DJ says that if you plug in a Pioneer DJ Rekordbox USB it’ll play pretty much instantly from it too – amazing. The jogs are great to use, although Steve Canueto, our scratch tutor, felt they were just a tiny bit laggy when scratching – he thinks it could be that they need firmer pressure than some to trigger, but couldn’t quite put his finger on it (sorry for the pun). That said he rated them “very good”. Sensitivity adjustment for the jogs would be an improvement, though. We felt the loop roll and other beat-tied functions were forgiving, ie they make you sound good when using them! We liked the way the saved loops work, which is a bit different to most DJ software. We loved the frequency range on the effects engines – you could, for instance, put a phaser only on the hi-hats of a house track while leaving the rest “clean” – very Sasha-esque. The touchscreen’s angle can be adjusted to suit several viewing angles. Note that the top of the screen protrudes when you’ve got it laid flat – best to carry this around in a bag or case. The Beat Jump works a bit differently to, say, the same feature in Traktor; it’ll jump back as expected, but if you jump forward, it waits till the playing tracks reaches the point you’ve jumped to before reactivating the loop. We’d like to see an option in the settings to choose whether this is the behaviour, or whether the playhead jumps forward with you when you hit the forward button on Beat Jump. The key lock is very, very good – up there with the best. It doesn’t introduce excessive artefacts, and overall is massively usable. Creative DJs will have a lot of fun with this, and with the key sync, which of course utilises the same algorithms. That said, we’d like to see true “next track” recommendations based on key and BPM tolerances – it’s already half-way there, but would be good to see a dynamic playlist of such choices upfront on the screen. We felt the pads were excellent. We feared they might just feel a little bit small, but in fact they were a joy to play on – finger drummers need not fear a thing here. You can also disable the pads entirely if you wish – a smart move for DJs who never use them and may fear hitting them by accident. One thing we did miss was being able to alter track metadata on the fly – particularly, to alter the star ratings (we tend to use these for “energy level”) by tapping the screen. 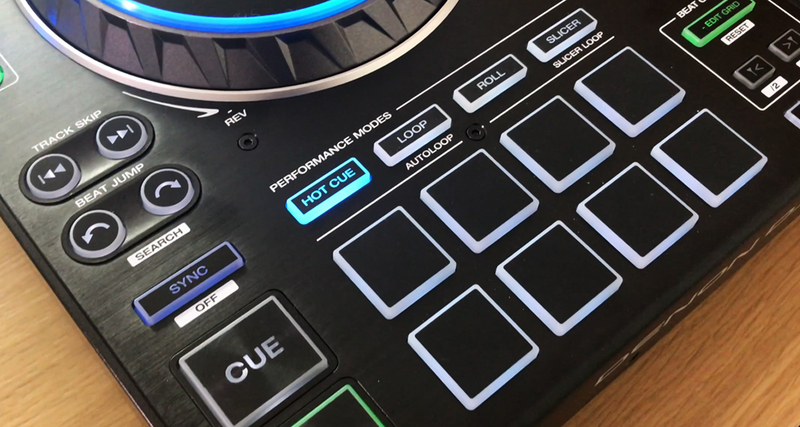 You can switch from “two deck mode” to “four deck mode” to make things simpler, which is great, but there are no “parallel waveforms” in a horizontal mode – a big omission, but one Denon DJ says it is currently putting right for a forthcoming firmware upgrade. 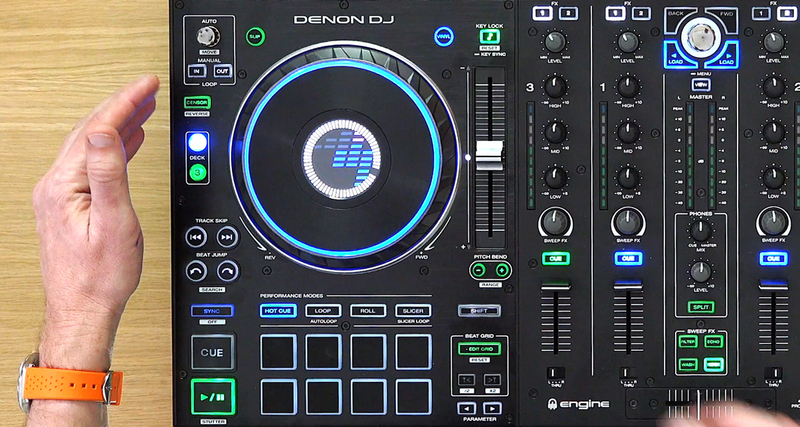 The way Denon DJ handles the library database is confusing, and to us, unnecessarily complex. There is a master collection containing crates if you wish, and then there are playlists, which can contain playlist folders. Meanwhile, and over on your laptop, there is also your computer’s file system to contend with. I think they need to simplify this: Maybe just make crates user-sortable, and do away with playlists (or similar). So is the onboard screen good enough to replace a laptop screen? Right, to put your mind at ease from the off: It is. It’s cool. It’s big, bright, and smoooooth. It’s a touchscreen of course, and has gesture control too (the main use being pinching the waveforms for the decks for zoom – you can’t “throw” the waveforms for a touchscreen spinback effect, unfortunately). You know when you go to a website that’s been designed for mobile devices first and foremost, but you go there on your laptop? You know how nice sites like that that are well designed feel on a bigger screen, with their fonts big and smooth, and everything simple and clear? That’s kind of how the Prime 4’s screen feels in use. The fonts are rounded, and large; and the graphics run super smoothly. It just feels like… well, like an iPad basically. Which of course is a good thing. The ability to position it at your chosen angle is great, and overall – top marks. Search is fine, gestures are fine – a few tweaks to usability and features as mentioned elsewhere would make it perfect, but we think most users will love it and take to it pretty much immediately. Sure, there’s a learning curve – but while it does feel a little steep every now and then, it isn’t very long. However, with all this talk of power, there are downsides. There’s no video: Although it can control visuals via the Link port, you’ll need to add Resolume for visuals or Sound Switch for lights, and it’s not the same thing as DJing with music MP4s. I think the “two FX engine” thing is a bit old school: The way Pioneer does the effects in its mixers and now the DDJ-1000 controller (and the way Denon DJ does them in its X1800 mixer) would have been better for this unit I feel – yes it’s a bit less powerful, but it’s more intuitive and becoming standard. There is more: Some may bemoan the lack of a sampler; others will feel the jogs are too small; others still may say it needs more powerful music management, especially if a DJ wishes to keep all of his or her music on the unit on a SATA drive and try and stay away from the laptop as much as possible. Overall, in this area, there is a learning curve – possibly inevitable when you ditch a powerful operating system and decade-old DJ software and try and do it all standalone. Is this the end for laptop DJing? But back to our original question: Do DJs need to take their laptops into the DJ booth at all now? Have we come full circle, back to the days where DJs simply turn up with their music and a pair of headphones and play on the gear that’s there, but with all the features of software finally available to them? Does the Prime 4 mark the beginning of the end for laptop DJing? This is a remarkably mature, hugely powerful, immensely exciting, and great value-for-money DJ system. It costs the same as Pioneer DJ’s XDJ-RX2. No contest there at all. You couldn’t even buy ONE Pioneer CDJ-2000NX2 player for the price of this, and it wipes the floor with TWO of them AND a mid-range Pioneer DJ mixer to booth. Ah, Pioneer. Pioneer DJ is the elephant in the room here. Because brilliant though Denon DJ’s gear is, it ISN’T Pioneer. And many Pioneer users are saying, “This is great, but Pioneer will come back with something, I’ll wait for that.” We know – we field this sentiment a lot on our site and socials. When you’re fighting a hugely dominant competitor, you need something special, and a good run up. Well, Denon DJ has something special, that is without doubt. How long a run up the company gets depends on what Pioneer DJ does next, and how long it takes them. The thing is, with every day that this unit is on sale, it is winning fans. For mobile DJs, home DJs, party DJs, controllerists, even some types of touring DJs, this system is currently very hard to ignore as a next purchase. It’s that good. 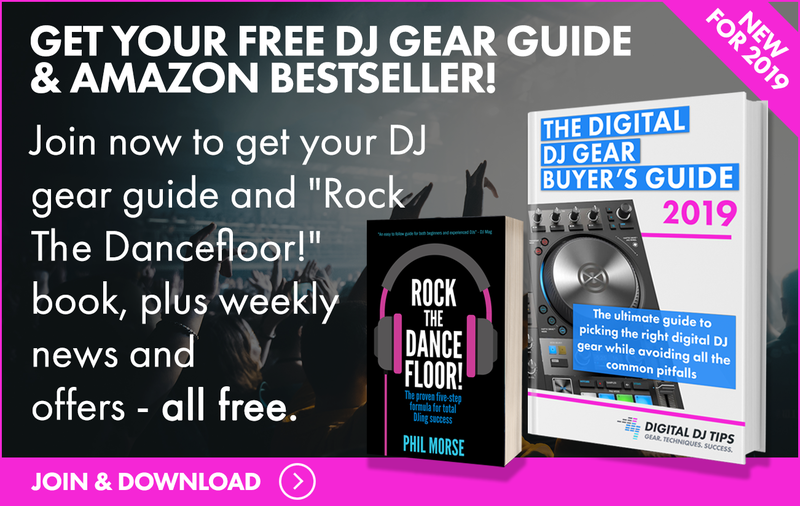 Indeed, it may actually help Denon DJ’s SC5000 and X1800 units get a foothold in club DJ booths, as people who start DJing on this unit reach the point where they are ready to play in clubs, and get the clout to specify Denon gear when they do. 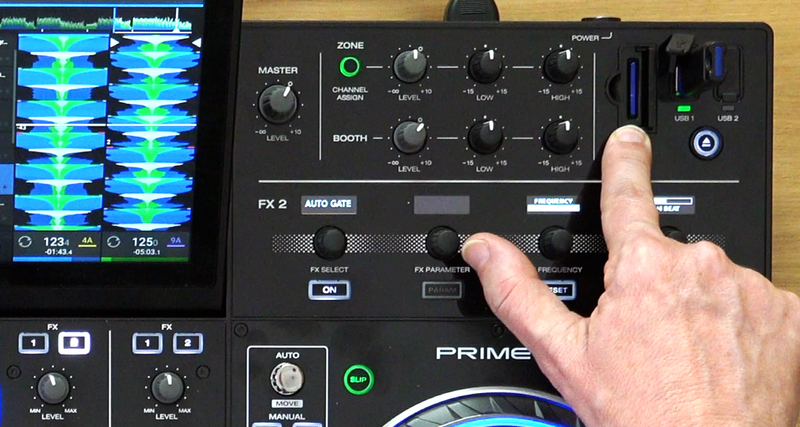 Overall, the next few years are shaping up to be very interesting in DJing, as the Prime 4 has just set a new standard. If you’re wavering, stop wavering and buy it. No problem Andre, Phil & Joey are busy boys at NAMM right now! Looks very awesome. Zone output and no laptop required. I like this unit. Don’t get me wrong. This is a truly amazing machine. I love it. But with the music industry pushing towards streaming, without actual ownership of physical files, this type of kit becomes less useful over time. Harold, the interesting thing about this unit is its potential. As it has essentially a powerful computer built inside it, it is limited to a great extent by what updates the company writes for it. So very little in the future is impossible with this hardware. The unit does appear to have a good amount of future-proof-ability! Having just read the DJ Mag article with Beatport CEO regarding a streaming future, I kinda agree with Harold. Surely if this unit had a streaming capable future designed in we’d be seeing Wi-fi connectivity in the spec’s!? Yep, have a Denon DJ app store, for 5 bucks download your favorite streaming app and off you go! really depends on what kind of music you play. i dont like the idea of stream for my purposed. i play a lot of progressive house, 90s music i ripped from vinyl, etc. but hey options are cool. my friend keeps all his music in the cloud. he showed me his collection. until we realized each folder had duplicates of the next! meaning he lost years of backup. my “cloud” is called an rdx quikstor. its like a usb 3.0 tape backup system. on amazon for 300. but im abit old school. and not getting paid were i play. As awesome as this unit is, what really matters is the software running it. IMO the prime software is a bit “glitchy”. Specifically, nudging with jogs is not tight. Quantize was inconsistent. Audible artifacts on playing-track when manipulating non-playing track using dual-layer on SC5000. Hopefully Denon will resolve some of these issues soon. I know they keep an eye on these comments, so you’ll be heard A M.
The big win here is for mobile/event DJs, in our opinion. What I like about this is what it means for the future. With that computing power onboard maybe we might see a controller in which services stream directly to the controller in our headlights (with streaming almost here)? I also like what Roland and Denon did with the drum machine onboard. Maybe even throw that in the mix? It seems to have went over well. I just wish they would do something better with their pads. I find those 8 play pads a little wonky. Thanks for getting this review out so quickly! What an incredibly impressive system. 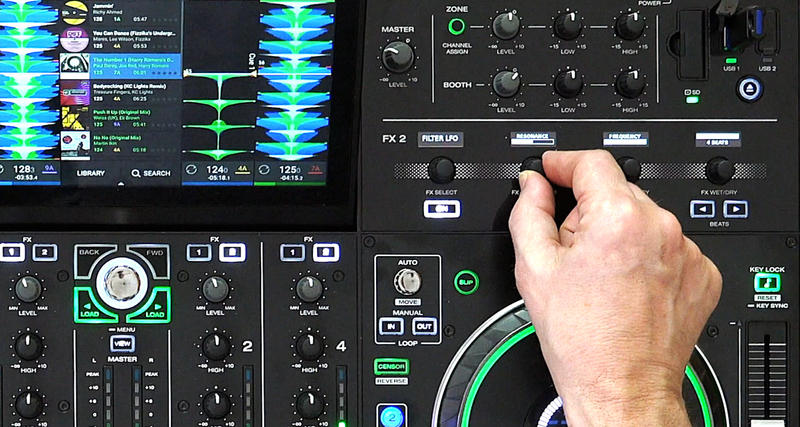 I may have missed it in the video, but is there a way to have parallel waveforms on the display (without the track menu in between them) similar to Serato, VDJ, Rekordbox DJ, etc.? Yes, you can have them vertically – horizontal stacking is coming, too. It’s pretty powerful… but we’ll know more after our full review. Incredible! Review is much appreciated. You’re very welcome, R J! so Phil you sort of alluded to this but how easy is it to add/remove songs to the attached hard drive? and can you keep normal file structures as you would on your computer? Amazing if you can just clone your drive and pop it in and drag files in and out like “normal”. Denon hardware team are bringing it! I hope these units are in for the long haul software/firmware support-wise. If they can develop the software at the same intense speed Rekordbox was at until recently then they’ll really be a force to reckon with. Oh and a 2 channel Prime Mixer to go with the SC5000M would round out the lineup nicely! With the Zone feature this is the must have controller for any Mobile DJ. Denon is making some good moves, may take some time but at least they’re making the right ones. Just read the DJ Mag article with Beatport CEO regarding a streaming future – surely if this unit had a streaming capable future designed in we’d be seeing Wi-fi connectivity in the spec’s!? Even if Wifi hardware not on board (isn’t it? Do we really know yet?) and the ever-present matter of “do you really want your DJ reputation depending on something like wifi (I wouldn’t), with usb-stick sized (and even smaller) USB Wifi dongles and there being plenty usb ports on the unit, adding Wifi support through firmware should be easy, same as for USB ethernet (RJ-45) support. kinda how i feel. i can invision someone just texting a playlist and having the unit play music thats either on the hd. or streaming. and no dj even needed. lol. getting the tunes i like and playing them the way i think sounds good. is so personal to me. and im sure most of us. 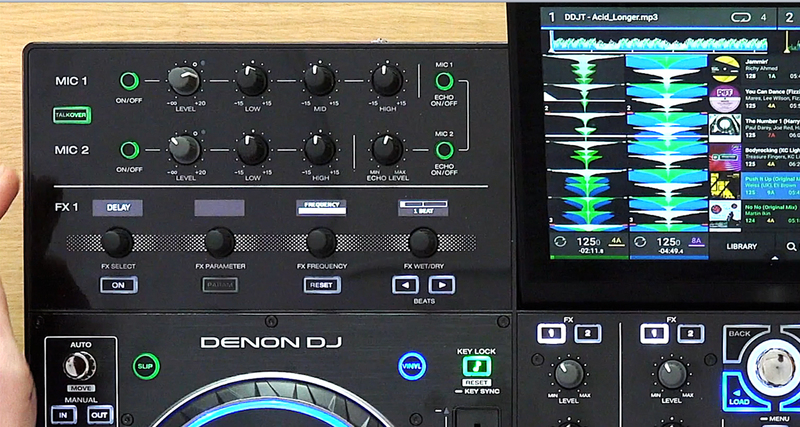 Interesting question, and I hope it makes sense, do you think the Denon will offer support for Djay Pro? I know it has the built in Engine Prime, but just curious since Serato is also in the pipeline…the reason I ask is I know Djay Pro has video output options. It looks like Prime 4 has the “StageLink” for video, so I hope Phil you can show how that works too, since I know you wrote about it in your awesome review! Thanks for all of your in-depth work! Such an exciting time to be a DJ!!! I’m very interested in DJay Pro actually because I gotta play some stuff from my iPad with Spotify during my DJ sets (which I absolutely hate) – but now that Serato has Soundcloud integrated in its software, I’m pretty sure it’s a matter of weeks for it to happen with Spotify. Hopefully. Any word on that guys? Or even better: I’ve heard a while ago, long time ago, that Spotify might come to Traktor but I’ve never heard of this again ever since. You ever heard of this? I hope you test Denon products with Sound switch I’m curious to discover this combination that seems perfectly logical: the stand Alone manages the audio and the computer manages the lights and / or the rest. But it’s hard to find a lot of information about sound switch. while Pioneer seems to show a more concrete solution but at the same time this solution rests entirely on the computer (audio and management lights / Video so it is more risky. Fantastic bit of kit and great review.The killer for me would be a bigger screen. I am a bit older dj and now now need to wear glasses.When I am out dj ing I use a 19″ all in one pc with my controller. If any manufacturer could incorporate a bigger screen into a lid much like a laptop which folds down that would persuade me to change my set up and would sell by the bucket load. Have we written 2018 somewhere? I’ve ordered mine. Looks an amazing controller. Do you know if it only holds up to a 1tb internal hard drive or you can use 2tb? Phil! Thanks a bucket load for this – I actually missed it. It sounds like you had a lot of fun @NAMM. I’m patiently waiting for your full review on it, I cannot wait. How about import new tracks via (in my case) iTunes while having a gig. Requests witch i don’t have i download on the fly and refresh traktor. You would download them, put them on a USB, and plug that into one of the spare USB slots. It would analyse them on the fly for you. Do you know if it its possible to plug in an iPhone and play the fresh download from the iPhone? You can always play a new track from an iPhone plugged in as a standard analogue source. plugging in a 1tb ssd is kinda the killer feature on this for me. PLEASE i hope there will be vertical waveforms though! Great review and some great Q&A’s from everyone else, have mine on order so paid attention to everything said, look forward to any review updates regarding the Engine software, other than that thanks to you all. No problem Ian, thanks for checking out the review! Is that a prediction or insider knowledge? I’m kind of bummed they didn’t copy Pioneers effects section. It just works. I also sighed a little bit when I didn’t see a parameter knob. Even though you can tweet resonance technically it’s not near as immediate. Other than that it looks amazing. Really looking forward to seeing pioneers answer to this. Thorough review Phil. Do users need to be concerned about viruses ? Any word on Virtual DJ8 compatability in terms of reading metadata and cue points ? What is the sound quality like ? I had a play with it at the DanceFair 3 weeks or so ago. Quality of sound is excellent. I have always found the Denon soundcards some of the best in the business. Being (also) a certified sound engineer I am sensitive to that. Especially the time-stretching is up there at or very near the top. 99% in-/decrease in speed and still usable quality audio. Gotta “see” it to believe it! Since the unit isn’t directly connected online I doubt viruses are not really an issue, at the very least no more than your laptop. My 3 cents, as usual. Agreed, this is quite bizzare behaviour that makes BeatJump useless I think. It doesn’t make it useless, but we agree, it would be good to have the option. Still a great controller, I’m more than happy to DJ on the XDJ-RX2. What about streaming? Do think it’s possible to plug in an iPad for just in case? Yes, you could plug an iPad into one of the channels if you wish. I personally think that “club standard” will slowly disappear. Lots of CDJ’s are becoming old and stale (club owners aren’t usually known for keeping current on gear) and more and more DJ’s are bringing their own gear (controllers) anyway. As there was a time Pioneer was NOT the club standard (SL1200s were with one of a few choice mixers – and Denon CD-players before the CDJ’s were launched), it’s not inconceivable that we are about to face a new period. One never knows :-D. All my three cents worth, as usual.